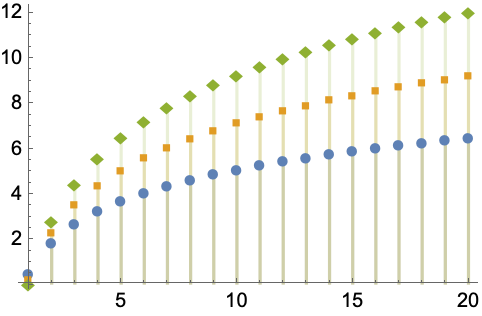 represents a zeta distribution with parameter ρ.
represents a Zipf distribution with range n.
ZipfDistribution[ρ] is also known as the discrete Pareto distribution. ZipfDistribution[n,ρ] is also known as the Estoup distribution. The probability for value and finite is given by and for infinite given by . 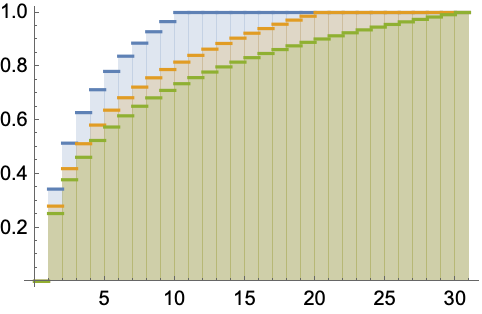 ZipfDistribution allows ρ to be any positive real number and n any positive integer. 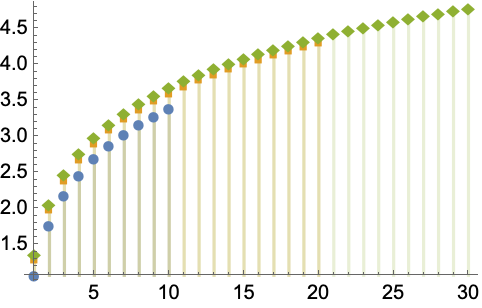 ZipfDistribution[n,ρ] represents a discrete statistical distribution defined for integer values and determined by a positive real parameter ρ and by a positive integer parameter n (the range of the distribution). The Zipf distribution has a probability density function (PDF) that is discrete and monotone decreasing, and whose overall shape (its spread, its domain, and its steepness) is determined by the values of ρ and n. The Zipf distribution stated is sometimes referred to as the Estoup distribution. 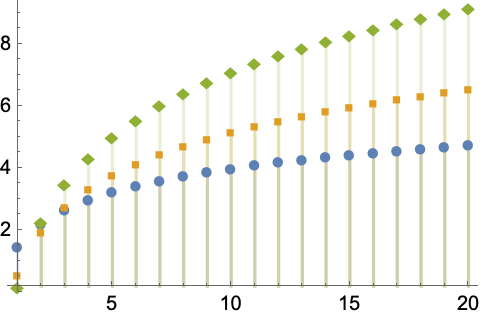 The one-parameter form ZipfDistribution[ρ] is equivalent to the limit of ZipfDistribution[n,ρ] as n→∞ and is most commonly referred to as "the" Zipf distribution, though it may also be referred to as the zeta distribution, Zipfian distribution, or discrete Pareto distribution (not to be confused with the continuous ParetoDistribution). The Zipf distribution is named for American linguist George Zipf, who applied the distribution heavily in his work on behavior and psychology throughout the 1930s and 1940s. Though the distribution was studied and applied in similar contexts by French stenographer Jean-Baptiste Estoup as early as 1912, Zipf's work inspired what is now known as Zipf's law (of which the Zipf distribution is the foundation), which states that the frequency of any word in any usage of natural language is inversely proportional to its rank in the language's associated frequency table. Many modern applications of the Zipf distribution are therefore related to linguistics and semantics, though the distribution has also been applied to phenomena in number theory, biology, and economics. RandomVariate can be used to give one or more machine- or arbitrary-precision (the latter via the WorkingPrecision option) pseudorandom variates from a Zipf distribution. Distributed[x,ZipfDistribution[n,ρ]], written more concisely as xZipfDistribution[n,ρ], can be used to assert that a random variable x is distributed according to a Zipf distribution. Such an assertion can then be used in functions such as Probability, NProbability, Expectation, and NExpectation. The probability density and cumulative distribution functions may be given using PDF[ZipfDistribution[n,ρ],x] and CDF[ZipfDistribution[n,ρ],x], though one should note that there is no closed-form expression for its PDF. The mean, median, variance, raw moments, and central moments may be computed using Mean, Median, Variance, Moment, and CentralMoment, respectively. 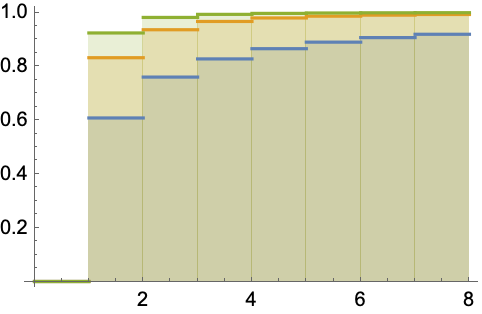 These quantities can be visualized using DiscretePlot. DistributionFitTest can be used to test if a given dataset is consistent with a Zipf distribution, EstimatedDistribution to estimate a Zipf parametric distribution from given data, and FindDistributionParameters to fit data to a Zipf distribution. ProbabilityPlot can be used to generate a plot of the CDF of given data against the CDF of a symbolic Zipf distribution, and QuantilePlot to generate a plot of the quantiles of given data against the quantiles of a symbolic Zipf distribution. TransformedDistribution can be used to represent a transformed Zipf distribution, CensoredDistribution to represent the distribution of values censored between upper and lower values, and TruncatedDistribution to represent the distribution of values truncated between upper and lower values. CopulaDistribution can be used to build higher-dimensional distributions that contain a Zipf distribution, and ProductDistribution can be used to compute a joint distribution with independent component distributions involving Zipf distributions. 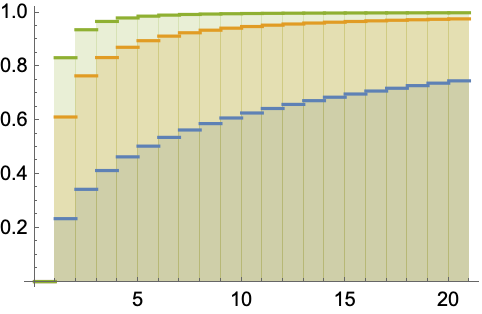 ZipfDistribution is related to a number of other statistical distributions. It is often thought of as a discretized version of ParetoDistribution and hence is related to PowerDistribution, StableDistribution, ExponentialDistribution, PearsonDistribution, and BetaPrimeDistribution. ZipfDistribution is also related to CauchyDistribution, LevyDistribution, PoissonDistribution, PoissonConsulDistribution, and SkellamDistribution.